Time once again for the hottest ticket in what's coming down the road -- in the latest new car concepts and updates to already popular car models. In 2019, the annual North American International Auto Show at Detroit's Cobo Conference Exhibition Center celebrates its 112th anniversary. The 2019 Detroit Auto Show will include the official debut of the eight-passenger SUV Telluride, the biggest Kia ever. 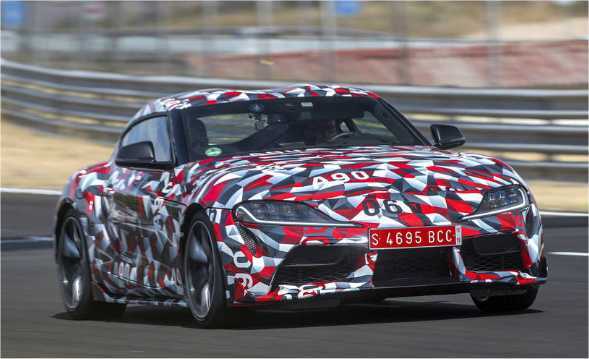 Joining Kia will be the new Toyota Supra sports car (above) along with the Toyota luxury division's highly anticipated 2020 Lexus RC F Track Edition; the 2020 Hyundai Palisade 3-row SUV; the new Volkswagon Passat; the 2020 Ford Explorer; and the Nissan luxury division's QX Inspriation concept car. 1965: Detroit Auto Show moves to the Cobo Center. • The Detroit Auto Show has been held in Detroit every year since 1907, expect during World War II. Through the years, the show has moved from various locations before settling into its permanent home in 1965 at the Cobo Center. • It's always been popularly known as the Detroit Auto Show, but its official name is the North American International Auto Show. The name change was announced in 1989 when show organizers wanted to attract more international car makers. • The Detroit Auto Show actually begins a week prior to the public opening. The first two days are for industry press only, followed by two days when auto insiders get a chance to preview the latest car models. There is also a charity preview day when all ticket proceeds go to Detroit charitable causes. The following day, the doors officially open to the public. • The Detroit Auto Show is actually two shows in one. While major attention is given to new makes and models coming off the assembly line, a different spotlight shines on concept cars that show off advances in car design, safety, performance and computer technology. • Each year, a panel of journalists judges new entries that are eligible to win the 'Oscars' of the auto industry, the North American Car, Utility and Truck of the Year Awards. As we wait for what's coming down the road in 2019 and beyond, check out the latest buzz from Detroit, Michigan for all the latest news, ticket information, exhibit maps and schedule. 2019 North American International Auto Show - The official site with late breaking news, press releases and photo archive along with online ticket purchase and times, driving directions, hotel and parking info, exhibit map and links to major exhibitors, Detroit Auto Show trivia, factoids, and history. Detroit Auto Show - Detroit News Online - As show time nears, watch for special reports from the digital version of the print paper with what to watch for, ticket information, sneak previews, editorials and reviews. Cobo Center - The official home of the Detroit Auto Show with easy access to directions, the best way to get there, parking, nearby attractions, and lots more. North American International Auto Show - Wikipedia - Broad overview of what happens in Detroit each year with lists of new entries & concept by year dating back to 1989. A Car Shopper's Guide to Auto Shows - Check out expert tips on avoiding the weekend crowds, what questions to ask, how to score a test drive and related advice for making the most out of your visit, from Edmunds.com.